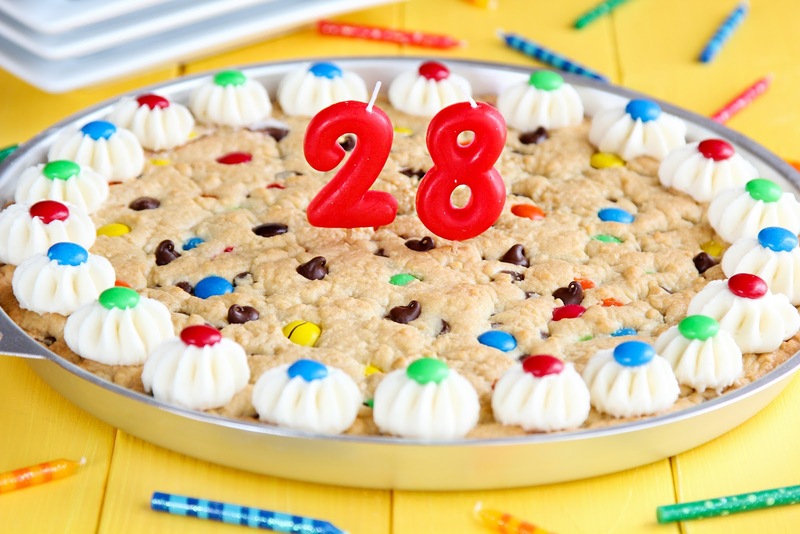 baking birthday cookie cake food recipe Stephen He's 28 + a Cookie Cake! He's 28 + a Cookie Cake! He's 28 + a Cookie Cake! - Hi, friend Popular Recipes, in this article entitled He's 28 + a Cookie Cake!, we have prepared this article well and concise to be easy to understand for you to read and can be taken inside information. hopefully the contents of the post Article baking, Article birthday, Article cookie cake, Article food, Article recipe, Article Stephen, that we write this you can understand and useful. okay, happy reading. One of Stephen's favorite birthday treats (besides an ice cream cake) is a giant cookie cake- especially the ones that you can get at a Great American Cookies. They come frosted around the edges and personalized in the center. Well, if you saw my post about the double doozies, you know that we live nowhere near one of those stores. So again, I decided to make my own version. I recently used my gift certificate from Karen's Cookies to purchase a giant cookie cake pan... knowing that one day I'd use it for this very purpose. When I looked at the insert inside of the pan I realized that there was a recipe for it. I went online, read some reviews, and decided to make a few adjustments in hopes of creating a more flavorful and moist cookie. I also needed to frost it which meant whipping up a batch of our favorite buttercream frosting. I carefully piped it around the edges, added some candles to the center, and voilà, the perfect birthday cookie cake! I know he's going to love it and I think it will taste just as good as the store bought kind! I can't wait until he gets home and I get off work so we can celebrate! 1. Preheat oven to 350 degrees. Line the bottom of a giant round cookie pan with a circle of parchment paper. Lightly spray edges of pan with baking spray, set aside. 2. In the bowl of a stand mixer, beat together butter and sugars until fluffy, about 2-3 minutes. Add vanilla and one egg, mix, then add the egg yolk and mix until combined. 3. In a medium size mixing bowl, whisk together flour, baking soda, and salt. With mixing speed on low, gradually add to wet ingredients. Mix until just combined. 4. Remove bowl from stand and fold in chocolate chips and M&Ms. Pour batter into prepared pan. Smooth out and sprinkle a few M&M's on top. Place in oven and bake for 16-22 minutes or until the top turns golden brown in color. Remove and place pan on cooling rack. Allow to cool for 45 minutes before removing from pan and frosting. 5. Meanwhile, to prepare the frosting, in the bowl of a stand mixer, beat together butter, vanilla, heavy cream and salt. With mixing speed on low, gradually add powdered sugar. Turn the speed up to high and beat until fluffy, about 5 minutes. Tint with food coloring if desired. 6. Pipe frosting around the edges of the cake using a large decorating tip. If desired, using a smaller decorating tip, pipe lettering in the center of the cake. NOTE: You can use any 9x13 cookie bar or brownie recipe in this pan, just remember to adjust the baking time accordingly! P.S. Don't forget to check out my guest post over at Lil' Luna! Thank You and Good article He's 28 + a Cookie Cake! this time, hopefully can benefit for you all. see you in other article postings.